Recently, I returned from a trip to the Galapagos Islands, where I had the chance to scuba dive with sharks and observe the pristine natural wonders the islands offer. I recommend that everyone visit if ever they get the chance. However, I would not recommend this destination for folks hoping to take a working vacation. 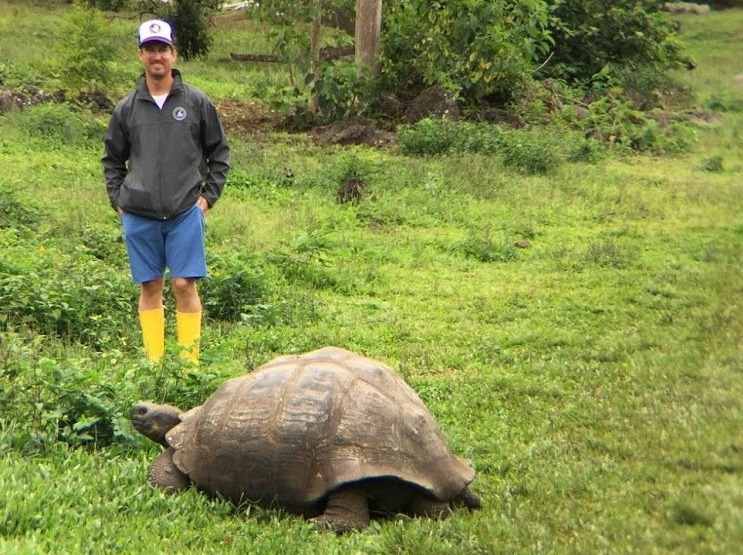 Although the Galapagos are home to numerous endemic plants and animals found nowhere else on earth, as they are uniquely adapted to its harsh climate (see Charles Darwin for more info), they are also home to some of the earth’s lowest internet speeds. And I mean slow… Possibly slower than the pictured tortoise! During my eight day trip, I had the opportunity to take hundreds of amazing photographs of its unique landscape and vibrant life, but virtually zero opportunities to share my amazing adventures on Google Photos or social media. 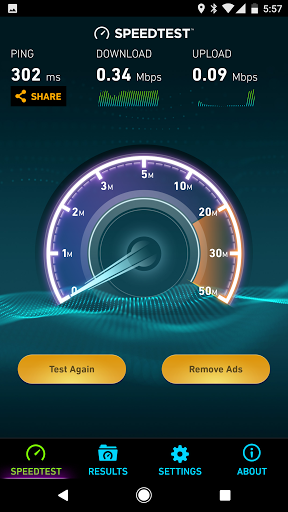 In fact, I found that the bandwidth on WiFi was exponentially slower than the bandwidth on cellular (shown above), leading me to believe there is no direct wire connecting mainland Ecuador with the islands six hundred miles west. This suspicion was confirmed after a quick Google search returned Zachary T. Kessel’s blog post surrounding internet in the Galapagos (http://confluence.gallatin.nyu.edu/sections/research/internet-in-the-galapagos). The result was a vacation within a vacation. That is, a vacation related to all things tech and I waited until I returned to Quito, which sits atop the world at ten thousand feet before I posted my first photo, which was actually a series of photos of just some of the places visited while in Quito and the Galapagos. Check it out here: https://www.instagram.com/p/BX1vhAAArD6/?taken-by=mmmmbrians. 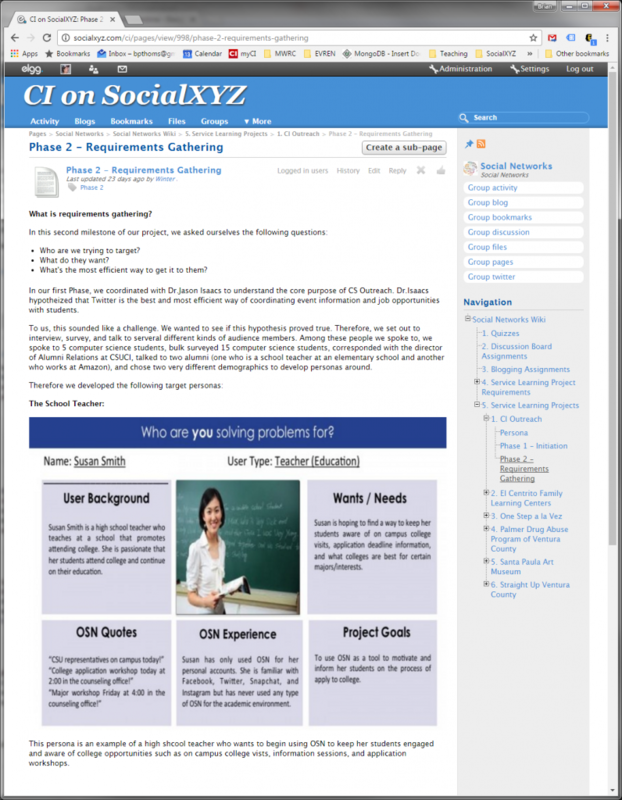 It is no secret that I rely heavily on social software throughout my teaching. With the exception of a few courses, which are heavily technical in nature, I apply social software in just about every one of my classes. However, in the past, I have utilized a combined approach, relying on the grade book available in institutional course management software (i.e. 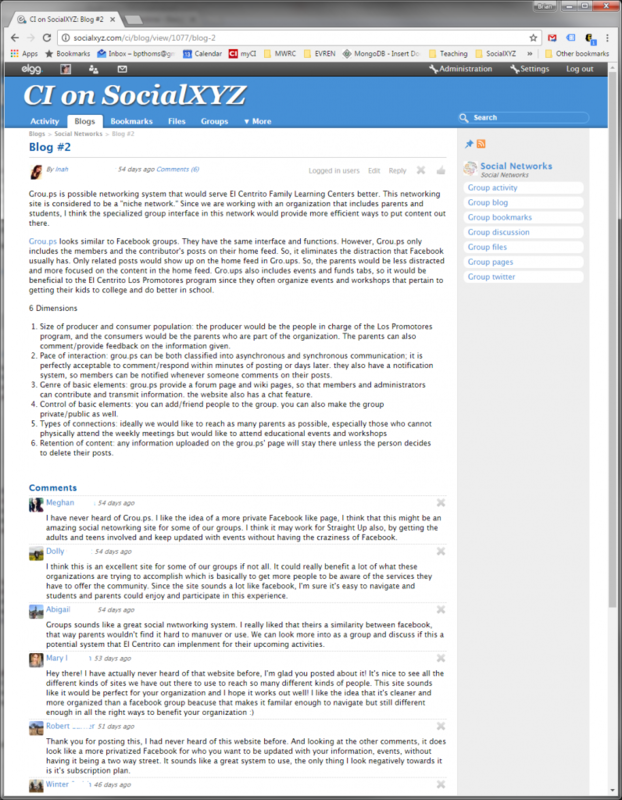 Blackboard, Angel), while utilizing social software to facilitate discussions, group writing and blogging. Feedback from students in recent iterations has suggested I use only one system. Well, first, it’s hard to find the time to develop them for one… . But I gave it a shot never-the-less. First, with the help from the folks at ClearDev, I moved SocialXYZ to HTTPS. 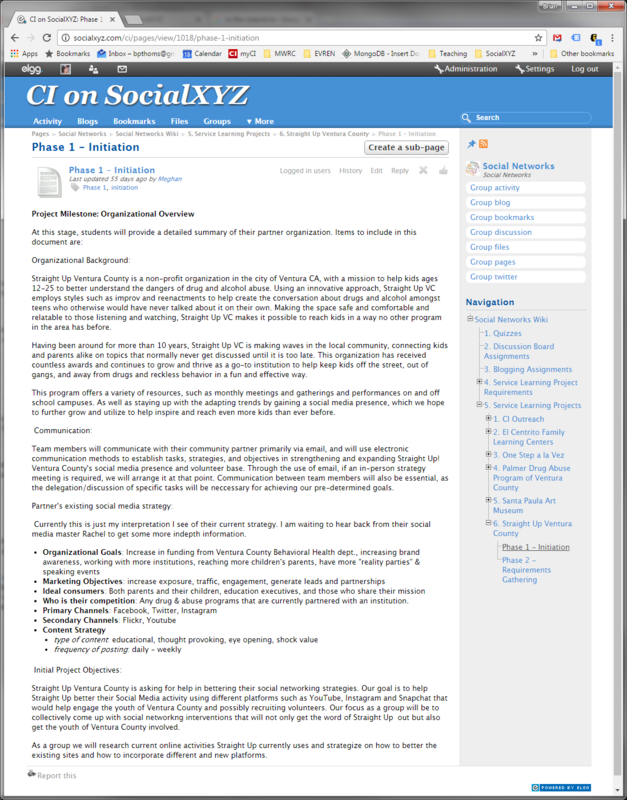 The HTTPS protocol ensures that website data being sent to and from SocialXYZ.com is encrypted. Usually this doesn’t matter, but across open networks, such as coffee shops, airports and public wifi, it is very important to help ensure that student grades are kept secure. Next, I needed to implement that gradebook to store those ‘secure’ grades I eluded to. This wasn’t so difficult, but it did require me to think quickly and creatively as to what a gradebook needs, without overdoing the requirements. After all, I had less than two weeks to analyze, design and implement this thing (I wonder if Blackboard operated on such time frames). The result is illustrated below. It’s not the prettiest gradebook, but it provides all the necessary functionality including the Assignment Name (and link to), Grade, Instructor Feedback, Due Date and Status (open or closed). 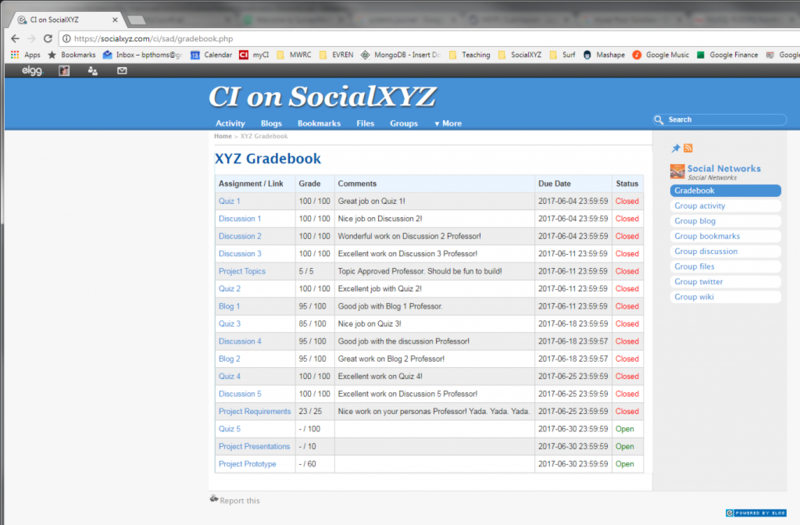 The backend consists of two database tables for gradebook_items and student_gradebook_items, which links specific students to their grades for those items. Finally, I also needed to add quizzes. This was more involved and required three new database tables. One for the quiz, which tracks each quiz and metadata surrounding each quiz such as the quiz id, quiz chapter information, quiz status as open or closed. 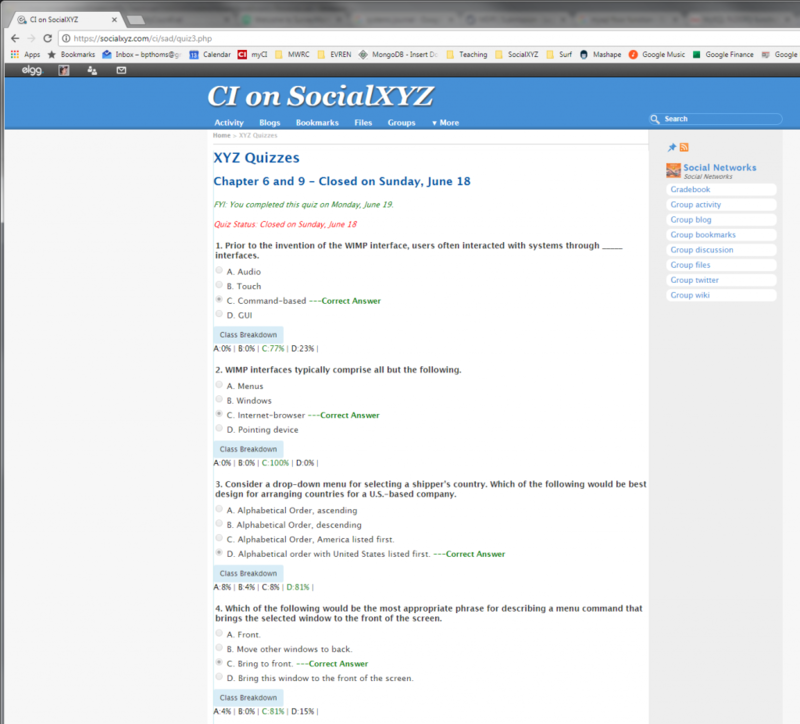 A second table tracked quiz_questions, which paired specific questions, available multiple choice responses and correct answers. A third table linked students with their quiz answers. The quiz interface required two new views of the database data. The first, illustrated below, is the user interface for taking quizzes. Students can save a quiz and return as long as the quiz remained open. Students can also submit a quiz, but return later on and edit their responses. Quiz answers are not shown until a quiz is closed. The second interface, illustrated below, is the user interface for reviewing quizzes. A nice feature of this quiz, while simplistic, provides users with a breakdown of class responses per question. With the summer session wrapping up this week, I am hoping to get some valuable feedback from students. In the past, I have focused specifically on interaction and community, with less emphasis on learning, so it will be interesting to see if students value this model better. Again, this is an accelerated online course, so results will not be conclusive, but they will provide very useful insight. I will also be able to compare these results to results from accelerated courses using Blackboard, albeit from a different course subject matter. 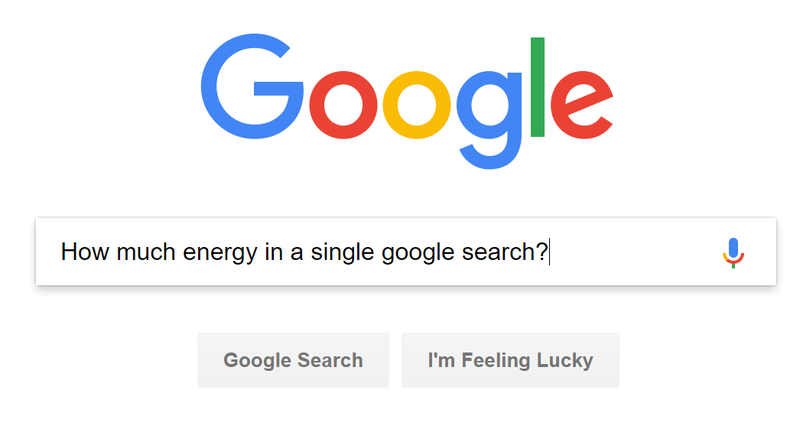 Have you ever wondered how much energy it takes to run a single Google search? It may haunt you, but every search query Google executes is equivalent to turning on a 60W light bulb for 17 seconds! Google Search, like many other technologies we use, including uploading grams to Insta or playing with filters on Snap, rely on cloud computing services. 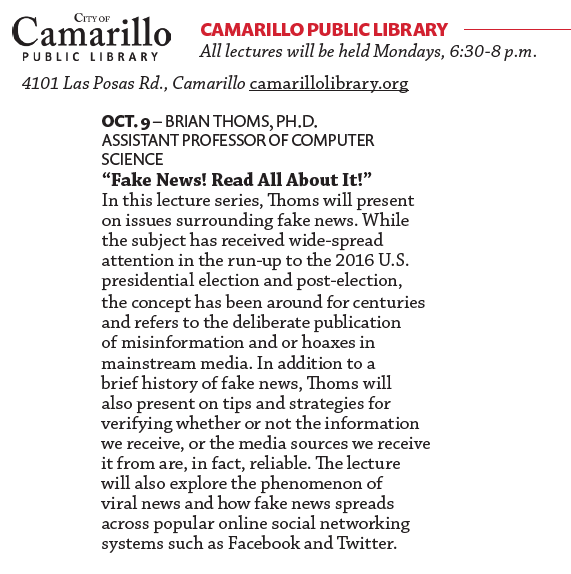 Background: On April 19th, the Department of Computer Science and Prof. Brian Thoms will bring a group of 20 students to Cal Tech to tour the campus, have a small bite to eat and attend the Earnest C. Watson Seminar Series. The seminar, titled, “How Green is the Cloud,” will be given by Dr. Adam Wierman, and will introduce students to his ongoing research at Caltech aimed at building a sustainable computing infrastructure—one where data centers are powered by renewable energy and even serve as virtual energy-storage facilities for more broadly integrating renewable energy into the electrical grid. Participating students will also receive a copy of the text, Sustainability Principles and Practice. You can discover more about Dr. Wierman and the Cal Tech lecture series here: https://www.caltech.edu/content/adam-wierman-how-clean-cloud. Who is invited: All CI students are invited, but preference will be given to students majoring or minoring in computing-related fields. There are 20 spots! Logistics: Buses will leave CI around 3pm on Wednesday, April 19th and will return around 10pm. Contact Info: Students interested in participating, should contact Prof. Thoms for more information.